According to EMILY’s List USA, a non-profit organisation dedicated to electing Democratic women to office, women have made enormous strides in recent decades, but there is still one glass ceiling left to shatter: sending a female president to the White House. EMILY’S List has launched the Madam President Campaign—a national campaign to steer America’s first female President to the White House through grass roots advocacy, community meetings and social media, led by EMILY’S List and helped along by their two million members. The aim of the campaign is to build a solid base of voters committed to the long-term goal of electing the first female president of the USA – and their sights are firmly set on the 2016 campaign. 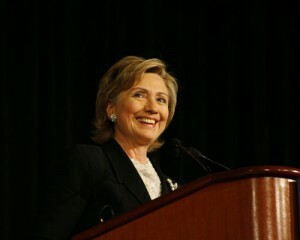 The Madam President Campaign follows the unprecedented support for female politicians in the 2012 election. EMILY’S List hope to ‘capitalize on the demand for women’s leadership that was made evident during the 2012 election, when the Republican Party overwhelmingly lost to progressive Democratic women candidates across the country’. The President of EMILY’S List, Stephanie Schriock, said that the fact that a historic number of women were elected to office in 2012 is evidence of America’s readiness for a female president. When announcing the Madam President Campaign, EMILY’s List released details of a poll that suggested American people were overwhelmingly supportive of a female President—with 86% of those polled stating that the US was ready for a female in the White House. Whether Hillary Clinton, former Secretary of State, will run for office is dominating the announcement of the Madam President Campaign. It is no coincidence EMILY’S List have referenced the glass ceiling in their campaign slogan – it was Hillary Clinton who said she put ’18 million cracks’ in the glass ceiling with her 2008 bid for the Democratic Presidential nomination. Although Clinton is the most likely contender at this stage, EMILY’S List is focusing on all potential candidates, including the current Secretary of Health and Human Services Kathleen Sebelius, Secretary of Homeland Security Janet Napolitano and former Washington Governor Christine Gregoire. The Madam President Campaign features a pretty cute campaign video of young female ‘presidents’ practicing their acceptance speech (‘Can you imagine? No woman president! They were all boys!’). The final part of the campaign video also features a somewhat familiar (Hillary-esque) female president taking the vow of presidency. An early prediction perhaps? This entry was posted in News, Politics and tagged Emily's List, hillary clinton, in brief, US president. Bookmark the permalink.